In its origin, the Chicago District Golf Association and what was then known as the Chicago District Golf Charities offices were housed in downtown Chicago. In the late 1970s, the organizations made the move to suburban Oak Brook. However, by 1998, after nearly 20 years of residency in Oak Brook, the CDGA began to look for a new home. It was during a meeting in 1998 between CDGA personnel, Frank Jemsek and Nick Mokelke of Cog Hill Golf & Country Club, that the seeds were planted for Midwest Golf House. After a land donation by the Jemsek family (owners of Cog Hill), planning and fundraising for the 22,000 square foot facility began. Throughout the duration of the project, the CDGA Foundation raised nearly $5 million in funds in a campaign dubbed “Sunshine Through Golf” (which was later made the Foundation's moniker). In conceptualizing the project, architects drew from visits to the Golf House, a United States Golf Association (USGA) facility in New Jersey, as well as the Metropolitan Golf Association headquarters in New York. A ceremonial groundbreaking was held in conjunction with the 2000 Western Open, with construction beginning that August. 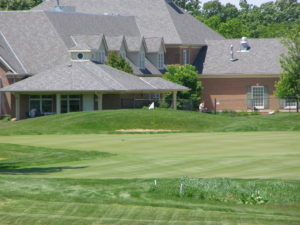 Midwest Golf House opened for operation on April 16, 2001, and had more than 300 people attend its formal dedication on June 3. Midwest Golf House currently houses the offices of the CDGA, the CDGA Foundation, and Illinois Junior Golf Association, as well as providing office space to other allied associations, including the Midwest Association of Golf Course Superintendents, USGA and First Tee. In addition to the administrative offices, the 100-seat Michael Keiser/Jerry Rich Education Center, a museum/library, state of the art turfgrass research facility and the Three-Hole Sunshine Course at Midwest Golf House also reside in the 15-acre complex. Copyright © 2017 The CDGA Foundation. All Rights Reserved.